“Clinical Evaluation of a Novel Horizontally Expandable Minimally Invasive Vertebral Body Replacement Spacer, Postoperative Outcomes and Radiographic Evaluation via Standard Radiographs and 2-D Reconstructive CT Scanning.” Fabian, Henry. July 2011. “Late Results of Thoracolumbar Fractures after Posterior Instrumentation and Transpedicular Bone Grafting.” Knop, Christian; Fabian, Henry; Blauth, Michael; Bastian, Leonard. Spine 2001; Volume 26, pp 88-99. “A Diagnostic Adjunct for Fat Embolism Syndrome: Pulmonary Microvascular Blood Analysis.” Adolph, Michael; Fabian, Henry; Elkhairi, Shukrei; Oliver, Alan. Journal of Orthopaedic Trauma, Spring 1994. 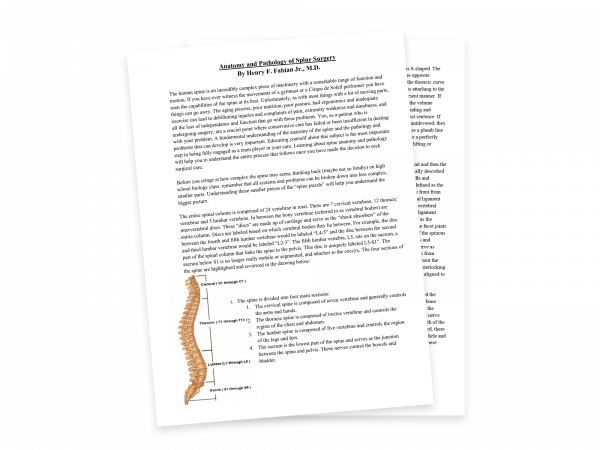 “Lumbar Spinal Stenosis, Diagnosis and Treatment.” Fabian, Henry. Marymount Hospital Doctor’s Notes, Fall 1997. “Clinical and Radiographic Evaluation of the XYcor® Minimally Invasive Expandable Vertebral Body Replacement Device; Evaluation of 49 patients and 69 cages July 2008 – March 2011.” Fabian, Henry; April 29, 2011, Las Vegas, Nevada; Scientific Advisory Board, Alphatec Spine, Inc.